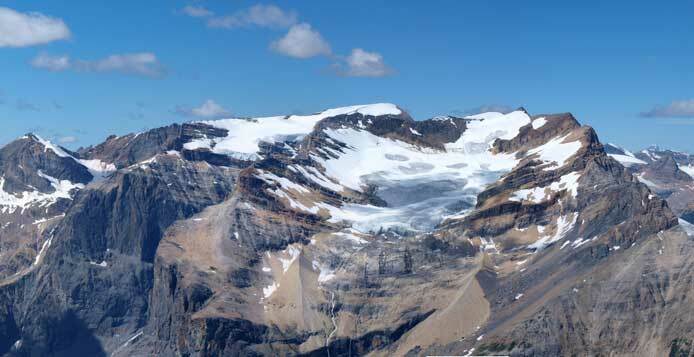 Wapta Mountain is not a big mountain, but surely an interesting one in the heart of Yoho National Park. 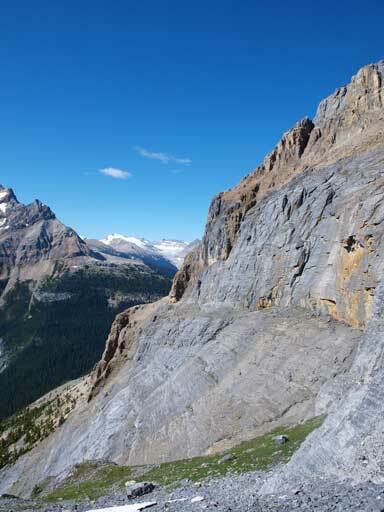 It’s rated as a “difficult scramble” in Alan Kane’s Scrambles in the Canadian Rockies, but after a bit of research, I found it was more than just a “difficult scramble”. 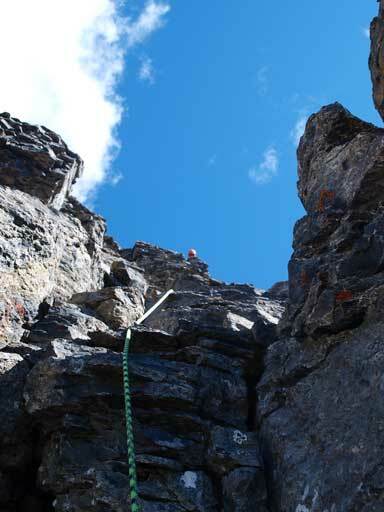 The summit block has a bypass ledge according to Vern’s trip report but the on-route crux chimney is actually a 5.4 rock climb. Therefore Kevin and I decided to bring rope and climbing shoes. We met at 6:15 am in the morning at the Petro Canada along Highway 1, drove to Yoho Valley and parked at the Whiskey Jack Hostel. This was also the start for Iceline Trail so not surprisingly, we were there with many tourists (hikers). 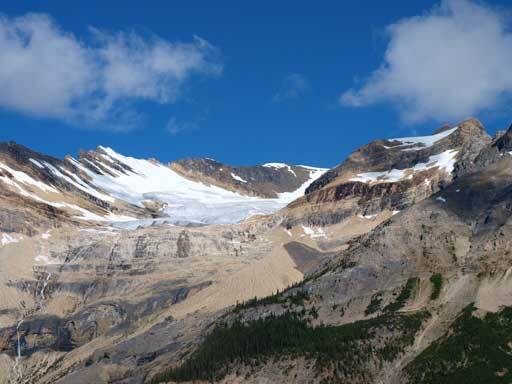 I did Iceline Trail during the Little Yoho trip two weeks ago, therefore I knew exactly where we should go. 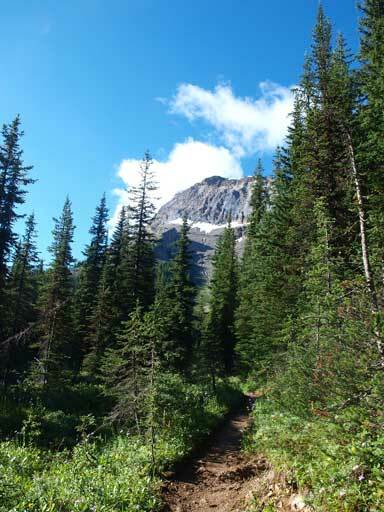 Basically, follow the signed trail towards Yoho Lake. 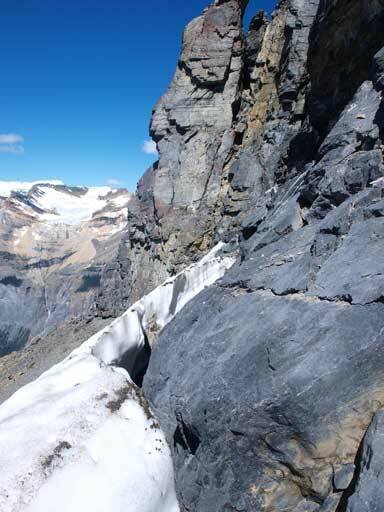 The trail started steeply up the headwall, but after passing the Iceline Trail junction, the grade eased and the trail traversed horizontally around the mountain towards south-west. 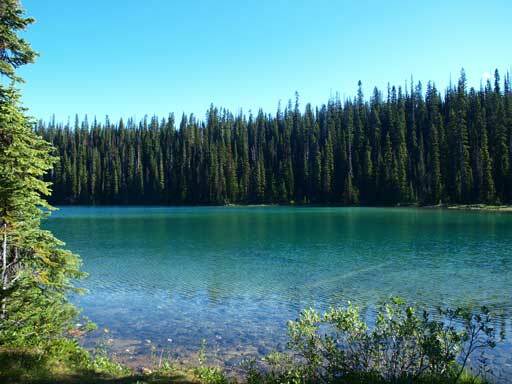 The approach was longer than expected but with fast walking we soon arrived at Yoho Lake. 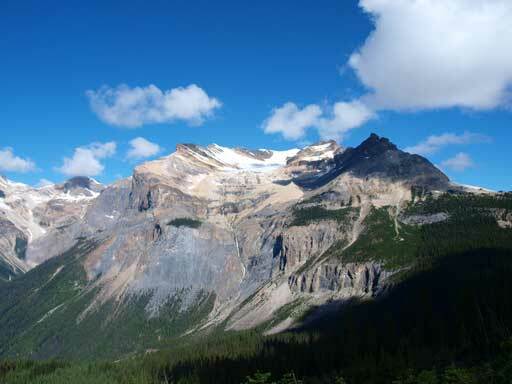 A view from Yoho Lake Trail. 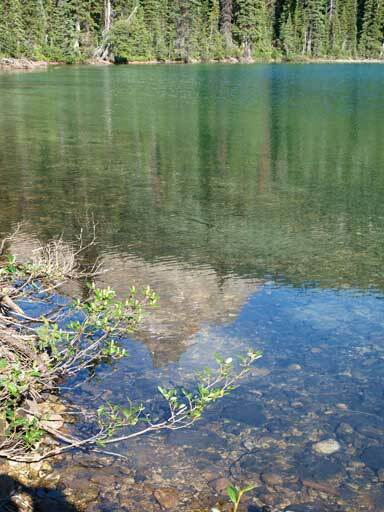 Circumventing the lake, we soon passed a campground. 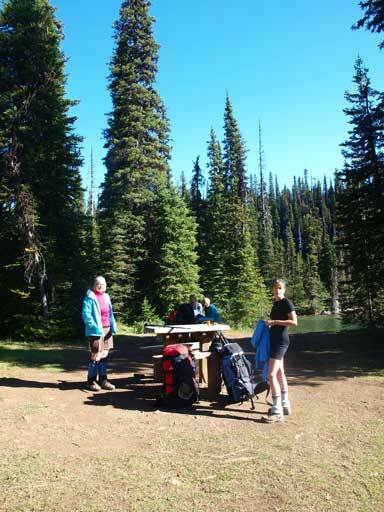 Comparing to Little Yoho, this campground was much quieter. 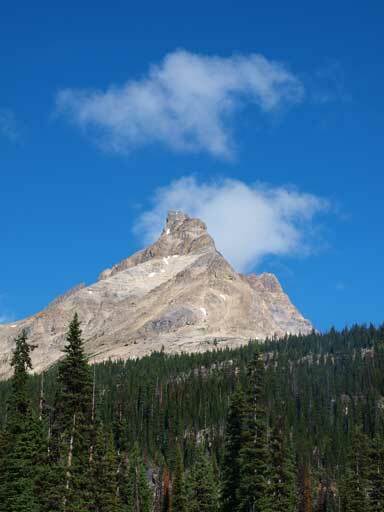 After that, we had to follow the signed trail towards Emerald Pass. 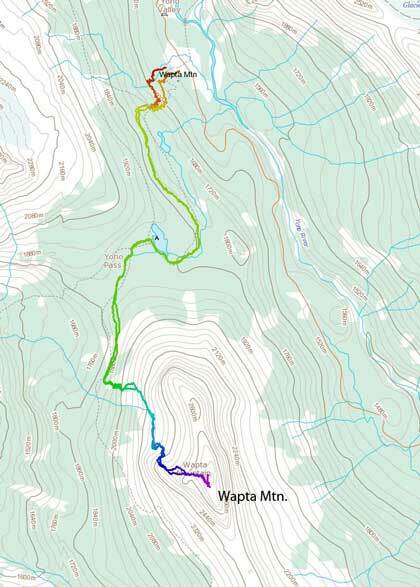 The trail travelled beneath the impressive cliffs for a short distance then entered the woods again. Soon after that the view opened up and we were in an avalanche gully. 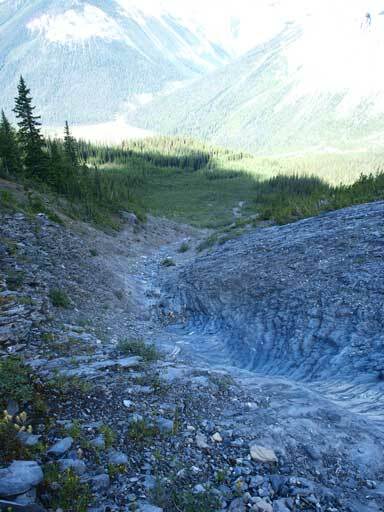 Note: This is not the gully you want to ascend. We kept going along the trail for another 5 min, then we arrived at the big avalanche slope. There we go, this was the one we wanted to ascend. By this point, you should be amazed by the view of Mount Carnavon and The Presidents. 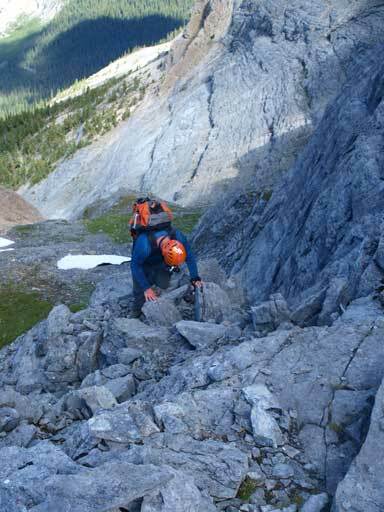 We took a short energy break and soon started trudging up the gully. 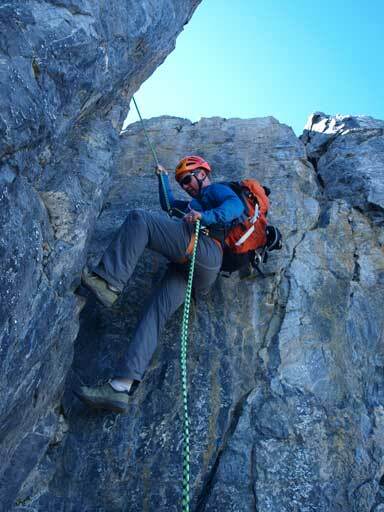 Taking Vern’s advice, we stayed in the middle to aim for interesting slab scrambling. It was harder than I thought and involved some hands-on stuffs. After a bit of fun, we traversed climber’s right out of the gully and ascended the grassy slope towards the first rock step. Following a path and some cairns, we pretty much walked up the first band. I helped Kevin taking a video for his Summits-for-Seniors Project, but it didn’t work out (we took another one on the way down for this part). Another grass slope led us to another rock band. This one was higher and more involved. I spotted a chimney and went straight up it, and it turned out to be more challenging… The hand holds were really good, but there was one overhanging move involved. The smarter Kevin did a bit detour and found a bypass which was only moderate. Oh well, he took the challenge on the way down for fun anyway, so we both got the chimney climb. Looking down at the access gully. The summit block. We had to traverse to the corner of bottom right. Traversing over the north corner, we were back on route again. 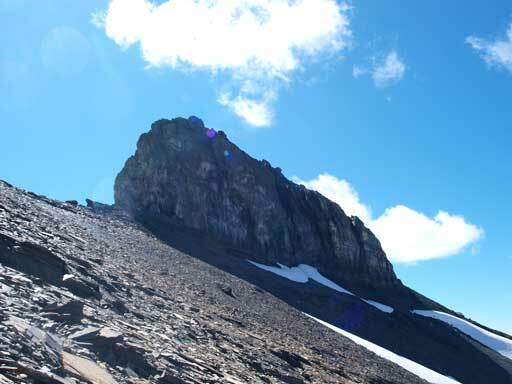 We traversed under the impressive cliffs while keeping our eye on them for searching the possible routes up. At one point we had to wedge in between rock and snow. The correct chimney was hard to miss as it was marked by cairns and flagging. We also spotted Vern’s bypass ledge. Kevin tried the ledge but backed off as he thought it was too exposed. Therefore we decided to rope up the chimney. From below, it didn’t look that serious though. 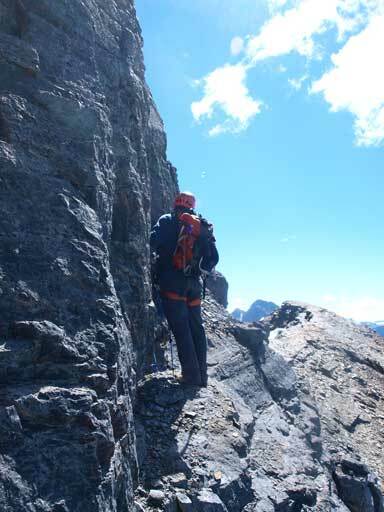 Traversing around the summit block. 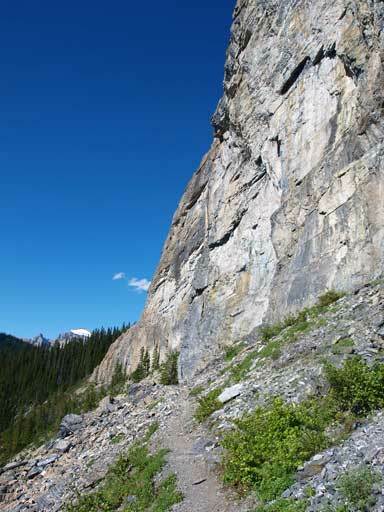 The crux-bypass starts at this ledge. We didn’t go up this way. 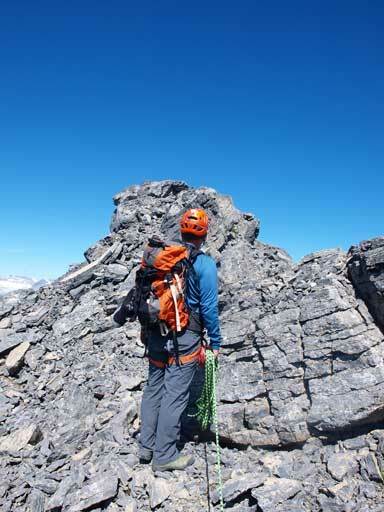 Kevin led up the chimney, which in his opinion, was a pitch of 5.3 rock. There’s one awkward and exposed move involved. 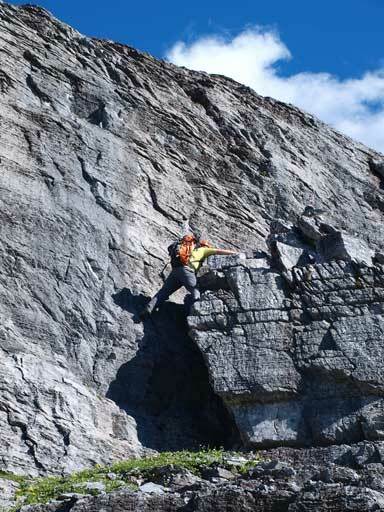 After this pitch, there’s another 5.4 rock step, but not super exposed. I’m not expert on grading but I feel it’s more technical than Fisher Peak’s crux, though as exposed. After this section we topped out on the exposed south ridge. I led up that section while practicing placing protection. Soon we stood on the summit. Now we are on the S. Ridge. Summit isn’t far from this point. 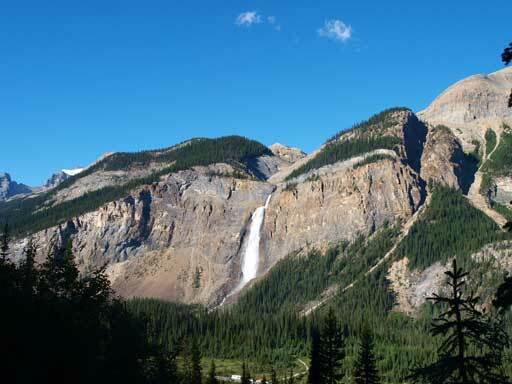 Looking deep into Yoho Valley. 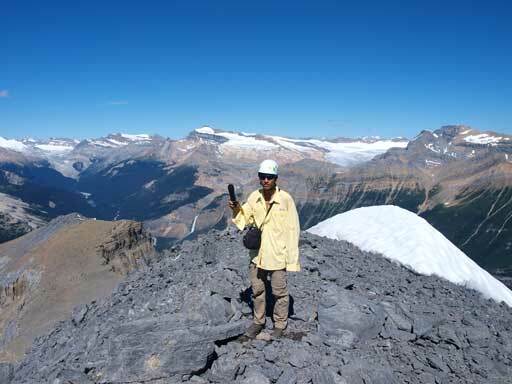 In the background are peaks on Wapta Icefield. 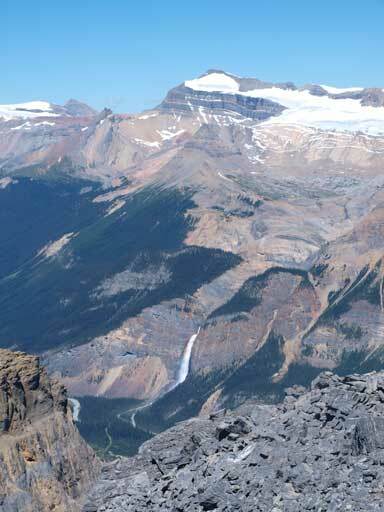 Kicking Horse Pass on left; Lake Louise/O’Hara group on center and right. 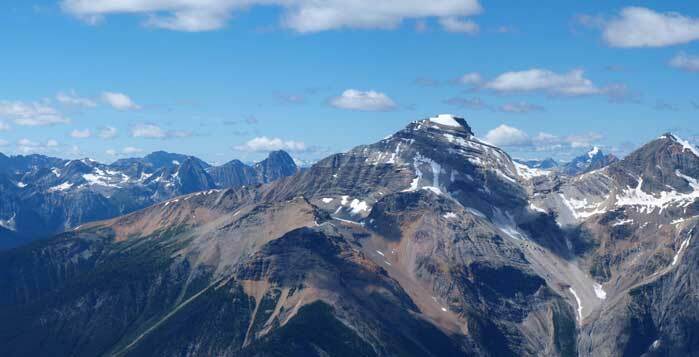 Mount Stephen of left; The Goodsirs at center; Mount Vaux on right. 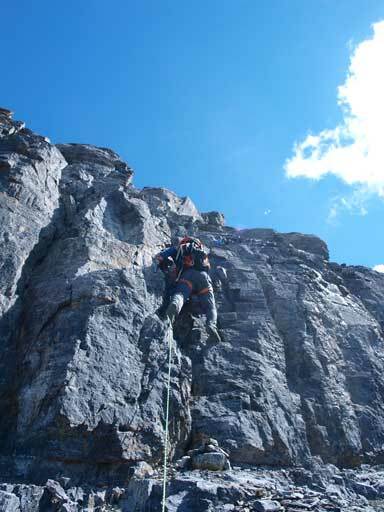 Obviously previous parties had rappelled down the mountain, which simplified our work quite a bit. However, we didn’t trust the webbing so we used our own slings. 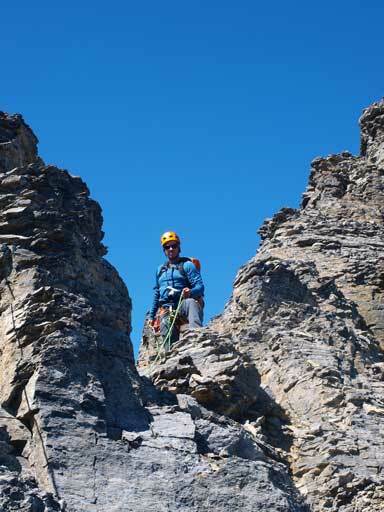 We had to be extra careful of rappelling as a small mistake can easily lead to tragedy. Kevin pretty much did everything for me as I’m the very beginner in terms of rope work. Putting on my weight on the rope while hanging above the cliff really made me nervous as it was so different from relying on my own hand and foot holds. 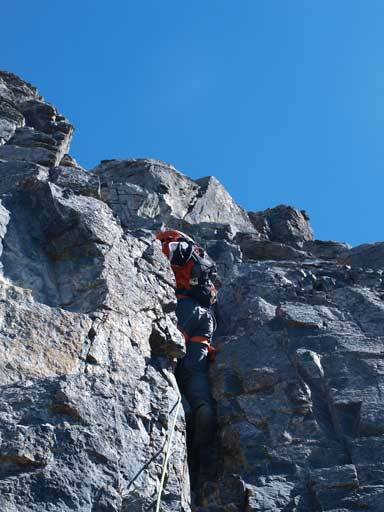 But on the other hand, this is much safer than down-climbing 5th class terrain. We had lots of time so we did some extra scrambling on the way down. Kevin also climbed back up the chimney on the first black rock band. 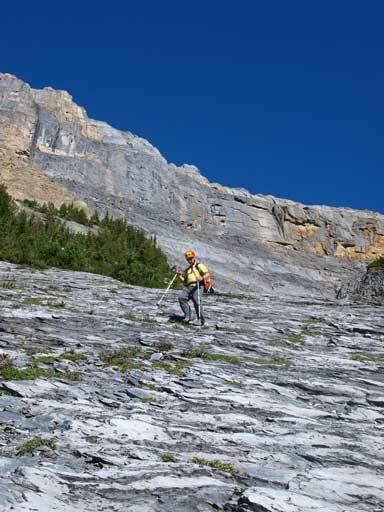 We stayed on the down-climber’s left side of the main gully, which forced us doing some unnecessary bushwhacking. We soon cut into the gully and that was much more enjoyable. At the end of the day, we enjoyed a pleasant hike out while soaking in the views. Kevin challenges a fun step that he missed on the way up. Kevin walking down the main gully. 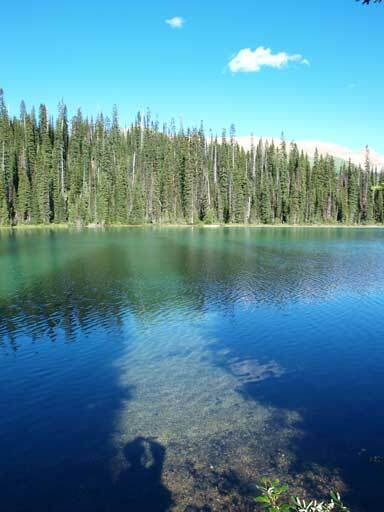 Another shot of Yoho Lake. I like the shadows produced by the trees. 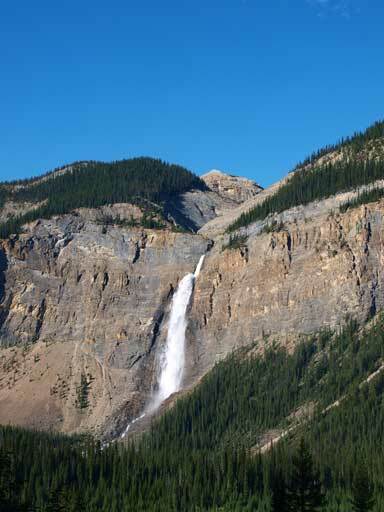 An obligatory shot of Takakkaw Falls at the end of the day. 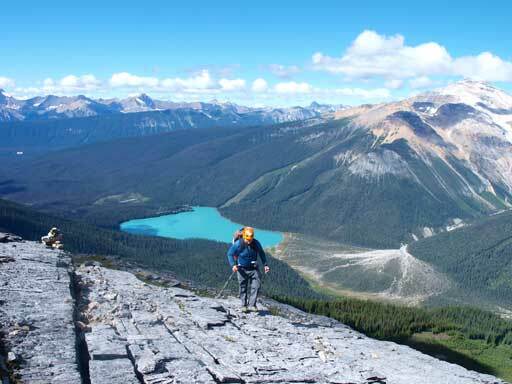 All in all I’d say Wapta Mountain deserves its reputation as being one of the harder scrambles in Alan Kane’s list. I’m happy to have it ascended and now I’m looking forward to the “top 2” – Northover and Smuts which I hopefully can get a chance to attempt in this year.